Last month I was excited to see my beloved band Umprey's McGee at a gem of a venue that I've heard about for years: The Stone Pony in Asbury, NJ. The venue and that part of NJ is indeed worth a visit; but what I really took away from the night, however, was another gem: local funk act, Waiting on Mongo. Waiting on Mongo is a seven piece band that includes Mike "Mongo" Latesta (Keys, Guitar), TJ McCarthy (Bass, Vocals), Matt Latesta (Drums), Mike Susino (Guitar, Vocals), Bruce Krywinski (Trumpet, Flügelhorn), Anders Carlson (Sax), and John Carlson (Trombone)​. 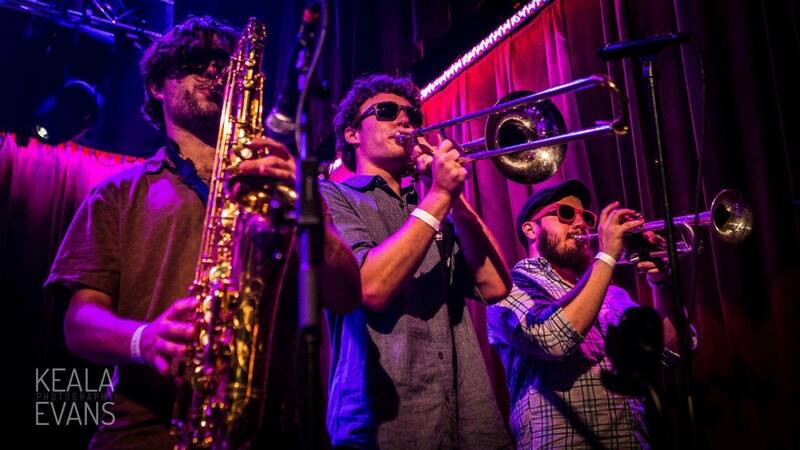 ​With influences like Phish, The Grateful Dead, Turkuaz, James Brown Dance Party, Lettuce, this funk outfit stays true to the genre and patrons they look up to-- by raising the heat, layin' on the horns and igniting dance parties wherever they play. I was so impressed with their musical prowess, their relationship on stage with each other, as well as, the love they receive from their fans, when I saw them play to a packed house for an after-party following the Umprey's show, that a few days later I reached out to ask them if they would speak to me. I felt that more people need to know about Waiting on Mongo, and get a taste for their talent. Karina Verlan: First things first, I can’t help but wonder at your name and its meaning! Could you share how you came up with it, what it means, etc? TJ McCarthy: So, Waiting on Mongo... Mongo comes from the movie Blazing Saddles, and we call our keyboardist Mongo, because when we were growing up we all worked at a bar/restaurant called the Norwood Inn in Avon by the Sea. My older brother and his friends all worked there as well, and they always messed around with us and they came up with the nickname for Mongo. KV: How did the band form? TM: We became a band before we even knew it. We were all just friends from day one who hung out all the time and did everything together, so we all listened to the same music and went to the same shows, and one day we decided to just jam. We did that for a couple years and before you knew it, we were all like, "Wow, we really like doing this. Let's keep it going and see how far we can take it." KV: You guys do some great covers of Grateful Dead songs and Phish. Can you tell me one song for each that influences you guys in particular? TM: Well the Dead and Phish are the kings of the jam. They've definitely influenced us in a big way. One Dead song that does it for our band is "Shakedown Street." It's such a party song and everybody knows it. We literally play it almost all the time because people always react so positively to it. A Phish song I'd say we love, which has a huge influence on us, and especially me, is "First Tube." It's the first Phish bass line that I learned, and it's really easy, and it just thumps, so it's a lot of fun to play . KV: If time and money wasn’t a constraint, what would be your ideal circuit for a tour down South? TM: I'd play everywhere, if we could. Big cities, if possible, like NOLA, Atlanta, Austin, Charleston, and the Carolina's. We haven't played a lot of places, yet alone even been to some of these states. I wanna see and play it all! KV: You released your first EP back in 2016, how was that experience? What did you learn? TM: Recording our first EP was awesome. We felt like musicians for the first time; although we were total babies in there. We had no idea what we were doing, but we learned a lot, and our next EP will be that much better ! KV: Have you considered putting in more time at the recording studio since then? TM: Definitely, going to try and lay down another album this winter! KV: I heard from local folk that you’ve done the after-party after Umphrey’s McGee show at Stone Pony for a couple of years. Are you Umphrey’s fans? How has it been doing those after-parties? TM: Huge UM fan! It's been the best! We feel a part of the jam scene on that night because Asbury Park is just flooded with music lovers and people accept our music right away. It's always really crowded and just always a real good night! KV: Who are the greatest influences that drive your love of funk and the desire to bring it to people’s ears? Why? TM: Turkuaz is everything right now. Talk about funk dance parties - go see them ! And funk is the greatest, it makes you dance your heart out. It has feeling. If it doesn't have feeling then it ain't funk . KV: How do you handle mistakes during a performance? TM: When we make a mistake while playing, we tend to just keep it rolling. That's the only thing you can do. There are obviously times where we don't handle it well, but that's all part of the learning process: being able to mess up and keep going and make it look/sound like nothing went wrong at all . KV: What was the first instrument that you ever played? TM: I first started playing guitar when I was younger. It was only about 4 years ago when I made the change to the bass. Same thing with Mongo (our keyboardist); he was a guitar player and has only been playing the keys seriously for about 2/3 years .